Putting into action its plan to corner the government, and Prime Minister Manmohan Singh in particular, over the CAG report on coal block allocation, the Opposition BJP did not allow Parliament to function on Tuesday morning, rejecting offers by the ruling party for a discussion on the report. 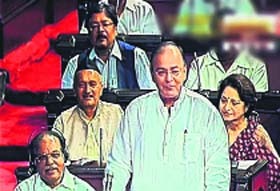 A TV grab of BJP leader Arun Jaitley speaking in Parliament . The Delhi Police on Tuesday slapped sections of the Information Technology Act against Gopal Kanda for allegedly sending false electronic messages leading to harassment of his former employee Geetika Sharma even as it recovered a third hard disk with vital clues during raids at his Gurgaon farmhouse. The Congress leadership today succeeded in mollifying a defiant Virbhadra Singh who had threatened to leave the party to press his demand for a lead role in the upcoming Himachal Pradesh Assembly polls. 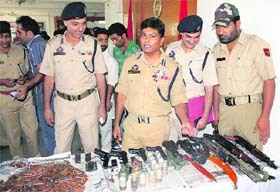 The Jammu and Kashmir Police has arrested two persons allegedly involved in 13 deadly attacks, including an assassination attempt on a cabinet minister and an attack on the civil secretariat, in the capital city over the past 18 months. 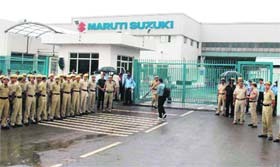 Partial production operations commenced at Maruti Suzuki�s Manesar plant, which reopened after more than a month today. The company management had declared a lockout at the plant following violence and arson on its premises on July 18. Continuing with its effort of locating communally sensitive content on the Internet, the Union Ministry of Home Affairs India will now seek legal recourse to identify the persons uploading such content. Sixty-five more web-pages having offensive content have been identified. Manipuris who fled Bengaluru and Pune after rumours of attacks being provided with medical aid, food and other help on the Manipur- Nagaland border on Tuesday. Kerala-based Popular Front of India has come under the scanner of intelligence agencies for its suspected role in spreading inflammatory SMSs and MMSs following Assam violence, that triggered exodus of northeastern people from Tamil Nadu and Karnataka.